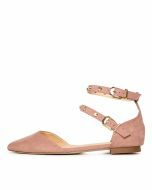 With dainty pointed toes and slender straps that wrap around the ankles, REDDIT2 by Verali are every bit as elegant as your favourite pair of pumps. The pair rest upon slight heels and are punctuated with polished metal studs. Dress them down with jeans or wear them on nights out as a comfortable alternative to stilettos.